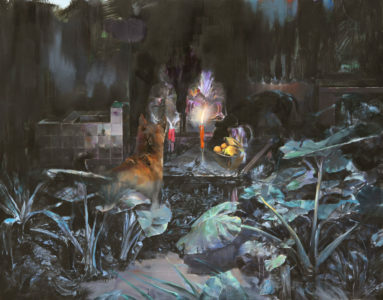 A recent graduate from the Sichuan Academy of Fine Arts, Cui Xinming (b. 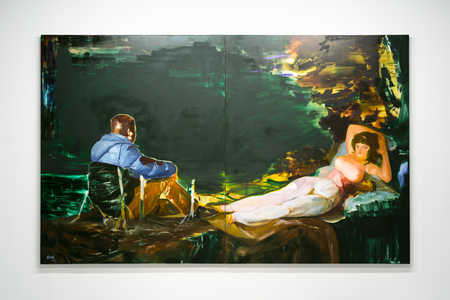 1986, lives in Chongqing) is a rising Chinese artist who creates expansive oil on canvas works that express, in an elaborate and vivid painterly style, the tumultuous thoughts and reflections of a younger Chinese generation that is living through a period of constant change. 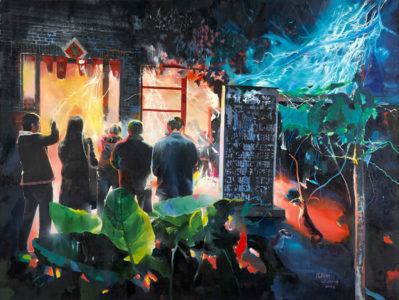 From Xinming’s early series ‘Black Hole of Memories’ to his most recent body of work ‘A Sleepwalker’s World’ and ‘Journey to the East’, Xinming addresses, in an evolving painterly style, how his peers and compatriots are casting into oblivion the past and its rich memories as an attempt to relentlessly attain a new stage of modernity. 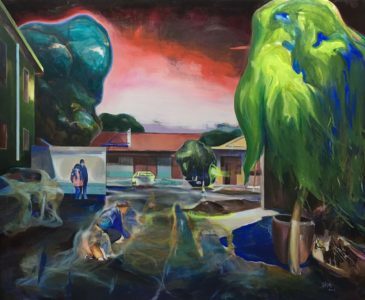 Throughout it is identified how, employing a strong focus and gestural strokes, Xinming addresses the challenges brought on by continual development. 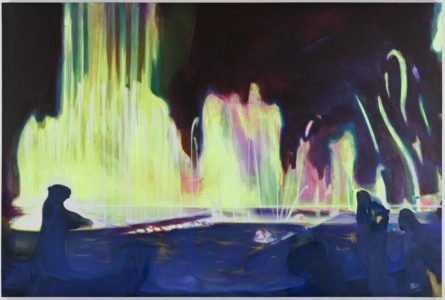 ‘Black Hole of Memories’, for example, introduced how Xinming approaches the canvas as an extension of his cognisance, mind and memory. 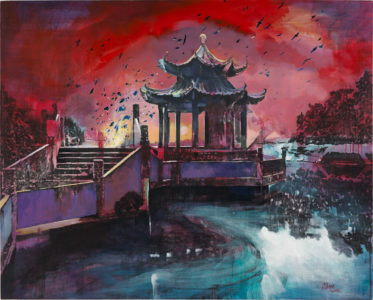 How privy to Xinming’s deepest memories and thoughts, one feels approximate to a trespasser, an infringer upon a terrain that is very much the artist’s own; these are visions from his childhood, a collage of his youth, laced with personal tremors and inveterate hauntings. 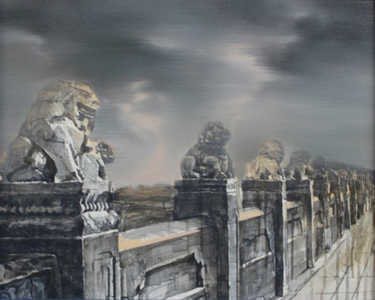 Yet, Xinming’s work very much lends itself for observation by virtue of its monumental scale and panoramic composition. 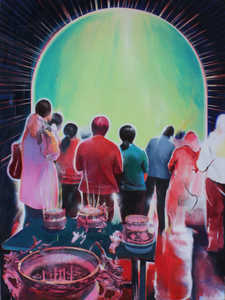 Indeed, true to the Greek roots of the word ‘panorama’, Xinming places all (pan) on view (horama): we are witnesses to every infinite detail. 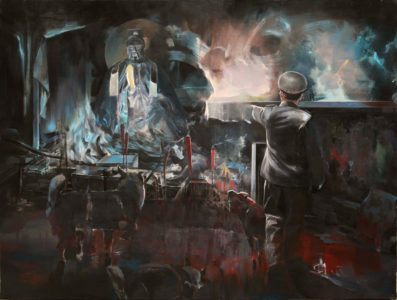 And although the subject of Xinming’s work may not oblige to the strict tradition of panoramas, that of depicting national military battlefields or public events, one immediately recognises that these are the scenes of a much more personal conflictual history. 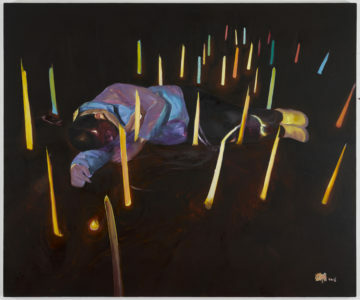 ‘A Sleepwalker’s World’ emphasises how each painting captures Xinming’s inner turmoils with regard to constant political, societal and personal change. 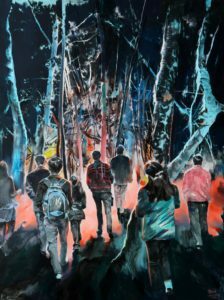 A highly introspective artist, Xinming observes himself, his position with regard to society and the values of those who surround him. 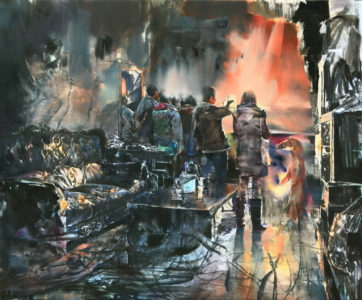 Where words do not capture his sentiments, Xinming approaches the canvas with incredible vigour and treats it as an extension of his visions and internal tensions. 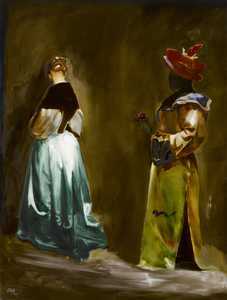 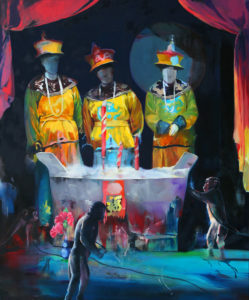 The scenes depicted are not figments of a strict universal reality; rather, they are dramatic and subliminal visions that Xinming’s mind has conjured. 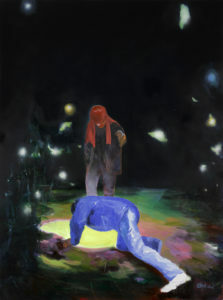 The series crucially does bear, however, a real-world relevance; each work is laced with secondary meaning, ranging from political to religious commentary. 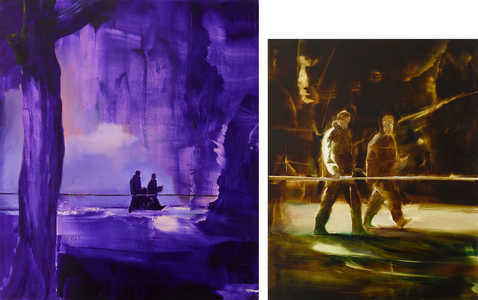 Indeed, this series brings out the narrative quality of Cui Xinming’s paintings, which pervades his previous ‘Black Hole of Memories’ series and his later ‘Journey to the East’ series, too; we are not but viewers to his work but also omniscient readers of an insightful socio-political commentary. 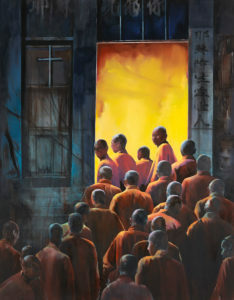 ‘Journey to the East’ follows from Xinming’s previous practice yet displays a remarkably luminous development in his painting technique. 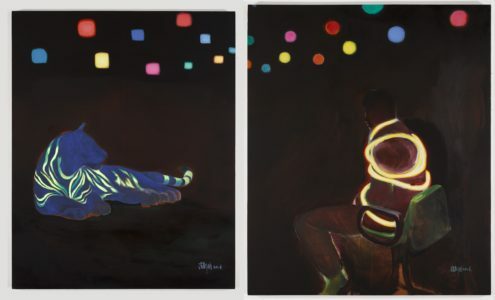 The vibrant, red-toned glow that permeates these new works heightens how, at the heart of Xinming’s oeuvre, there is a sense of hope. 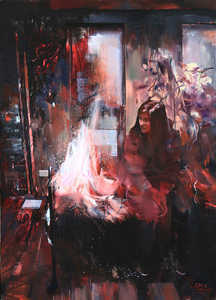 Whilst their mnemomic themes and distinct literary qualities seem to openly invite an aura of darkness, Xinming conversely finishes each of his istorias with a more hopeful twist: each narrative that draws on the emptiness of humanity, the animality of our society and breaks down perceived illusions of grandeur, is not destined for absolute disillusion. 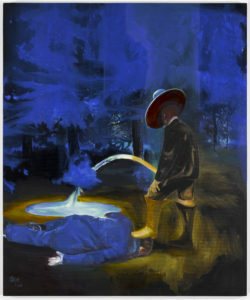 Cui Xinming is a highly lauded emerging contemporary Chinese artist based in Chongqing. 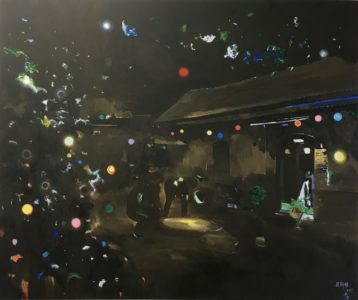 Recently selected for the prestigious 2015 ‘Luo Zhongli 10 Years Review Exhibition’ at the Chongqing MOMA, he has previously held solo shows in Hong Kong and has been exhibited in Istanbul, Berlin, Beijing and Chengdu, amongst other locations. 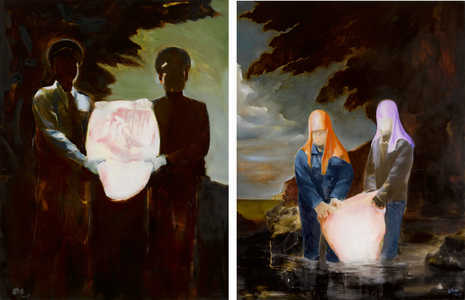 In 2010 he was nominated for the 1st Zhang Xiaogang Graduate Contemporary Art Scholarship and came in third place at the 2nd Chinese Institute Annual Art Exhibition. 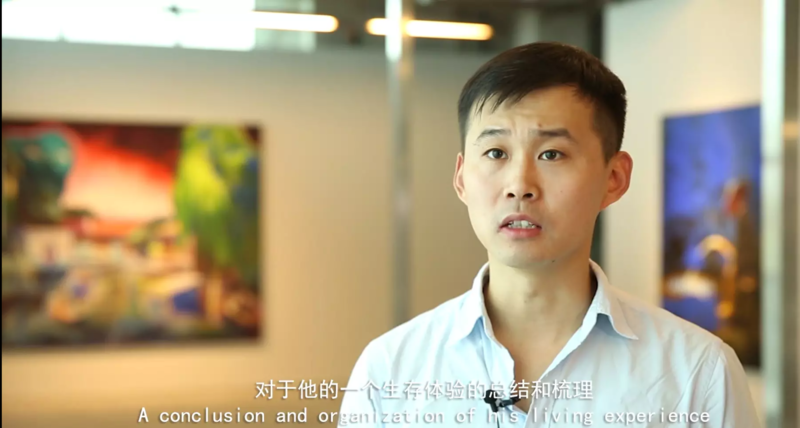 His work has been featured in multiple publications, including the South China Morning Post, Art Info, The Art Newspaper, Oriental Daily News, Flash/On, and Artron.